Help children to understand and manage their anxiety with this engaging and imaginative workbook. The Anxiety Gremlin is a mischievous creature who loves to gobble up your anxious feelings! The more anxiety you feed him, the bigger and bigger he gets and the more and more anxious you feel! How can you stop this? 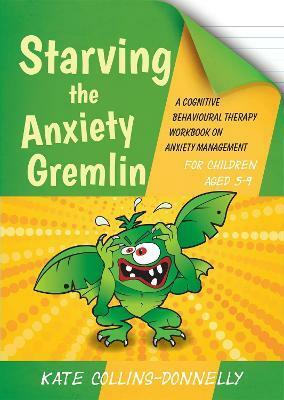 Starve your Anxiety Gremlin of anxious thoughts, feelings and behaviours, and watch him shrink! Based on cognitive behavioural principles, this workbook uses fun and imaginative activities to teach children how to manage their anxiety by changing how they think and act - getting rid of their Anxiety Gremlins for good! Bursting with stories, puzzles, quizzes, and colouring, drawing and writing games, this is a unique tool for parents or practitioners to use with children aged 5 to 9 years. Acknowledgements. About the Author. 1. Why Read This Book. 2. Let's Meet a Mystery Creature! 3. Let's Learn About Feelings! 4. What is Anxiety? 5. Things We Get Anxious About. 6. Why We Get Anxious. 7. Our Anxious Bodies. 8. Our Anxious Behaviours. 9. What Effects Anxiety Can Have. 10. Starving the Anxiety Gremlin Strategies. 11. Your Anxiety Dos and Don'ts. 12. Completing Your Mission to Starve the Anxiety Gremlin. Appendix: Quiz Answers. Information for Parents and Professionals. References. Kate Collins-Donnelly has worked as a therapist, psychologist, criminologist and anger management consultant based in the UK for many years. She presently runs a successful independent consultancy practice which provides cognitive behavioural therapy, counselling, coaching and training, and is head of the Psychological and Criminological Research Division. She is the author of several books for children and young people published by Jessica Kingsley Publishers, including Banish Your Body Image Thief, Banish Your Self-Esteem Thief and a range of titles in her Starving the Gremlin series.